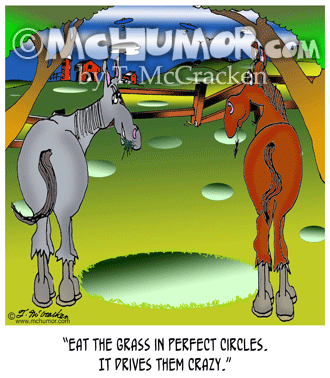 Horse Cartoon 8829: A horse says to another, "Eat the grass in perfect circles. It drives them crazy." 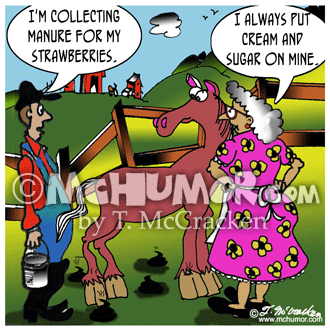 Horse Cartoon 2838: Someone says to a woman with a horse: "I'm collecting manure for my strawberries." 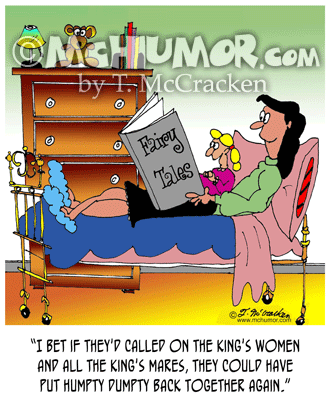 The woman says: "I always put cream and sugar on mine." 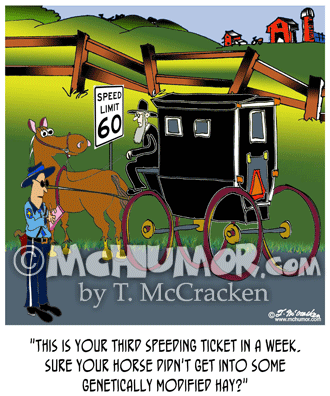 Amish Cartoon 9132: A highway patrolman in a 60 MPH zone writing a ticket to an Amish man in a horse drawn buggy says, "This is your third speeding ticket in a week. 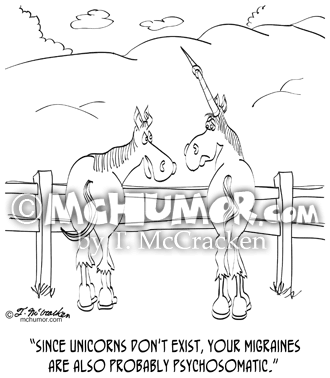 Sure your horse didn't get into some genetically modified hay?" 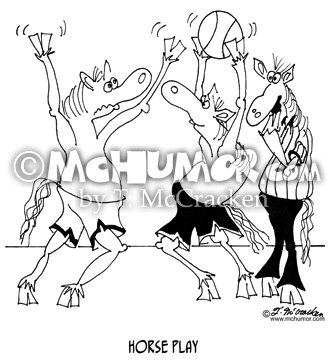 Horse Cartoon 6626: "Horse Play." 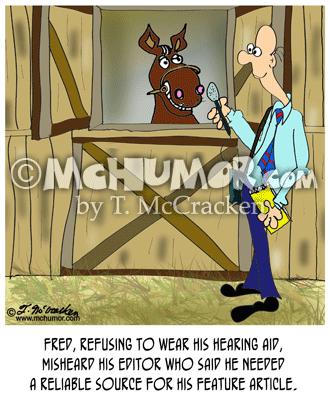 Referees and players at a basketball game are horses. 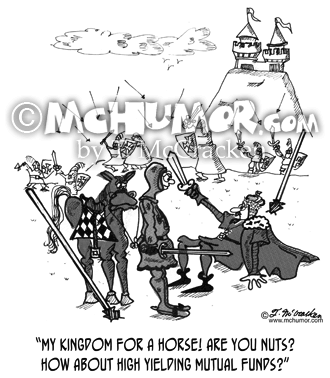 Horse Cartoon 2151: King Richard on the ground saying to a knight, "My kingdom for a horse! Are you nuts? How about high yielding mutual funds?" Kid Cartoon 4863: Kid saying to her mother reading to her, "I bet if they'd called on the king's women and all the king's mares, they could have put Humpty Dumpty back together again." 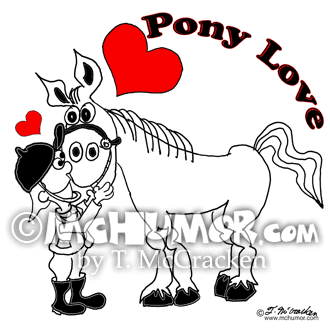 Pony Cartoon 8518: “Pony Love.” A little kid in riding gear is eye to eye with a pony with hearts above both of them. 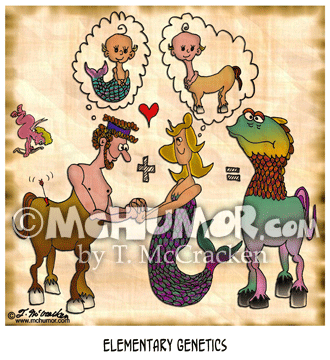 Biology Cartoon 5501: "Elementary Genetics" Cupid shoots an arrow into Pan who falls in love with a mermaid. They dream of having cute little satyr (half man half horse) and mermaid babies, but end up with a creature having a fish's head and a horse's body.